Residence Sisouk is a fabulously stylish boutique hotel located in a renovated colonial building along Pakse‘s riverside. Ad Book now! Rates from US$27.89++. Average rating 8.6 from 491 reviews. Pakse has an abundance of new gaudy large hotels and crumbling dinosaur guesthouses with sullen service—few accommodation options here take care to look to Pakse’s past. Residence Sisouk is one of the exceptions. Occupying a corner in the old French Quarter, just 300 m south of Route 13, the hotel’s tastefully designed rooms are unique in shunning the conventional cookie cutter approach to hotel room styling. Rooms are beautifully appointed with eye catching details such as Lao fabrics, black and white prints and photographs and ornate metal window bars. These traditional details are complimented by crisp white linens, plush comforters and elegant wooden and wicker furnishings. There are of course mod-cons: WiFi, air-con, flatscreen TV, minibar and modern bathrooms with both a shower stall and tub. The oversized corner rooms are considered the best, with four poster bed and ample light pouring in from the windows and balcony doors. Breakfast is included and should you need more space the relax, sleek Cafe Sinouk is on the ground floor. 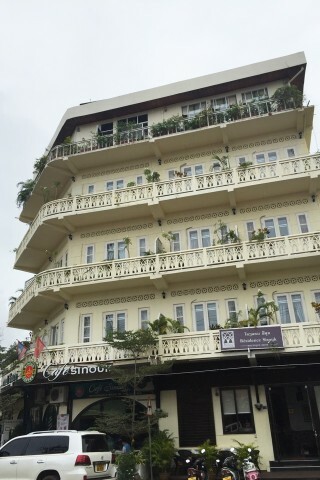 Check rates at Residence Sisouk Boutique Hotel on Booking.com.